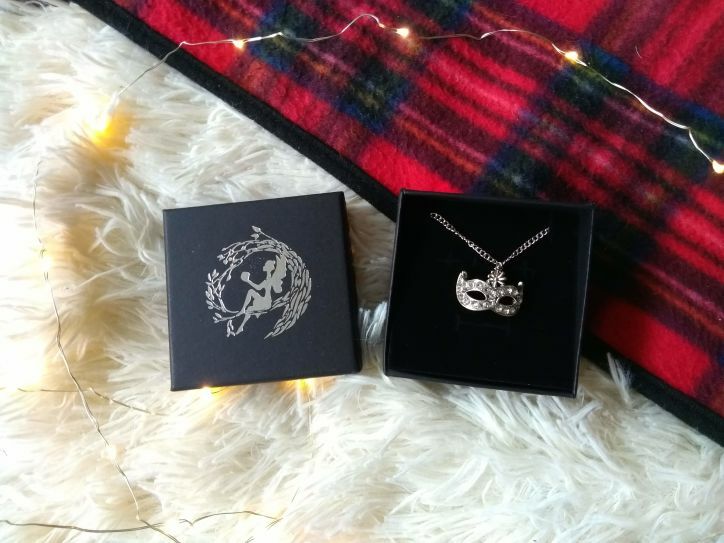 Needless to say, I love Fairyloot. I have nearly been subscribed to them for a year (holy hell has it already been a year?!) and I have loved every box! June’s Rebel’s in Ballgowns box was no exception. Here is my unboxing for this incredible box! The first item included was an exclusive “Corvere” candle designed by Geeky Clean. 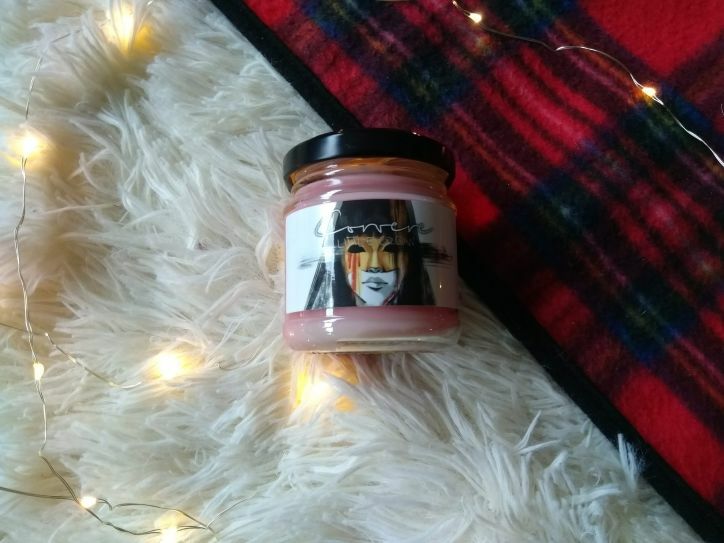 This Nevernight inspired candle is scented with strawberries and pepper and smells delicious! 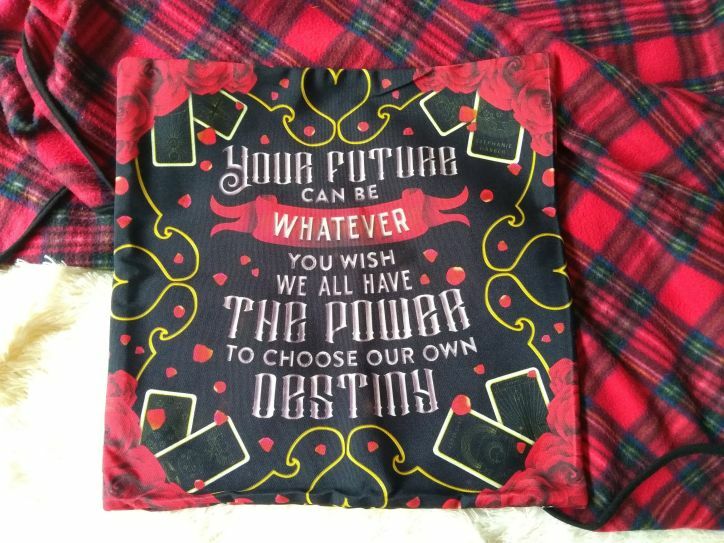 Next is an exclusive “Destiny” cushion cover designed by Miss Phi! This absolutely stunning cover features a quote from Legendary, a book I am very much looking forward to reading after recently finishing Caraval! This item is going to be so super exciting to use. This exclusive reading journal designed by FictionTea Designs also features quote art from Stella’s Bookish Art. I had something very similar to this in my bullet journal but I have not been able to keep up with it (too much life stuff going on!) Incredibly excited to use it to track what I read! I love bookmarks, that is no surprise to anyone. 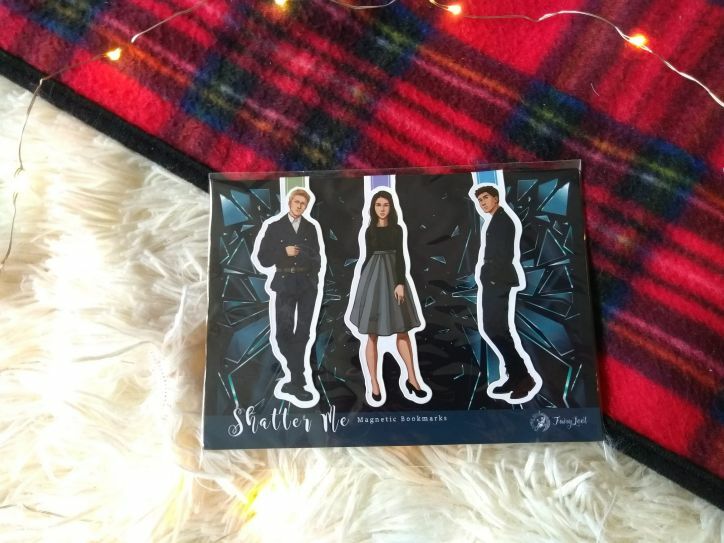 So to have these exclusive “Shatter Me”magnetic bookmarks to add to my collection is a joy. The design is from Taratjah Art, these are based on the characters Warner, Juliette and Adam from the Shatter Me series. I really should get around to reading that at some point, huh? I love pretty necklaces and oh my gosh, this Masquerade Mask Necklace is everything. It’s super shiny and the design is GORGEOUS! Oh how I love chances to gush over Ink and Wonder items. 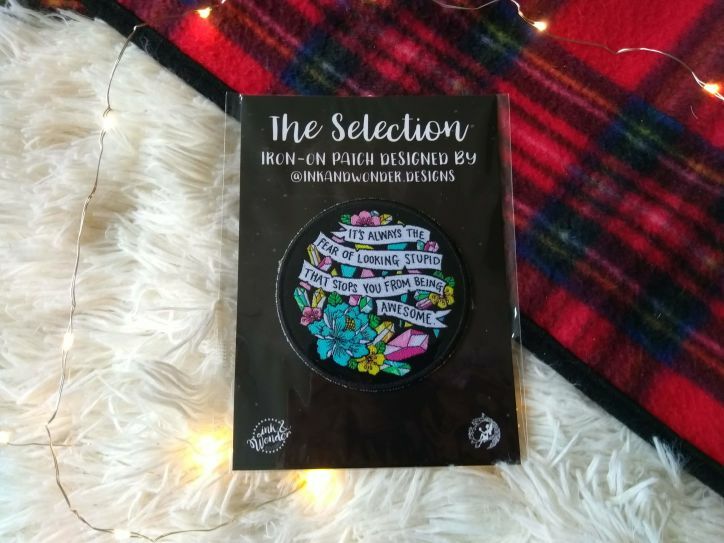 In this box, they designed an exclusive “Looking Awesome” Iron-On patch and I love it. No idea what I’ll use it on mind, but I love it! 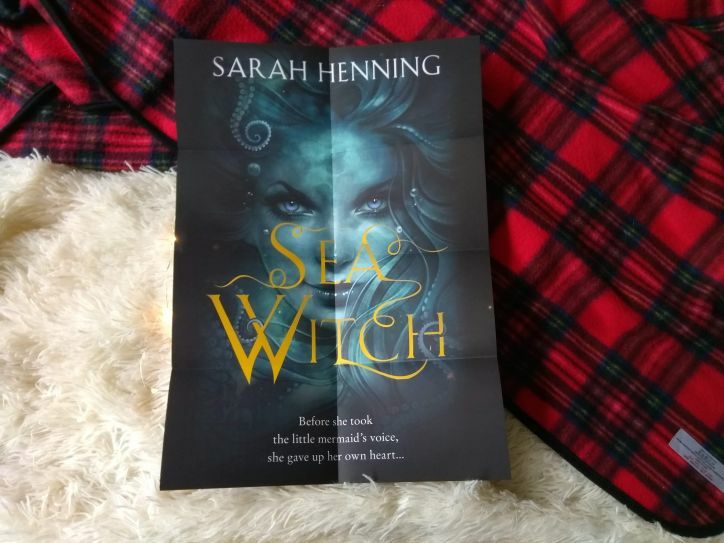 Bonus item: As for the bonus item for the box, a Sea Witch Sampler was included which looks beautiful! 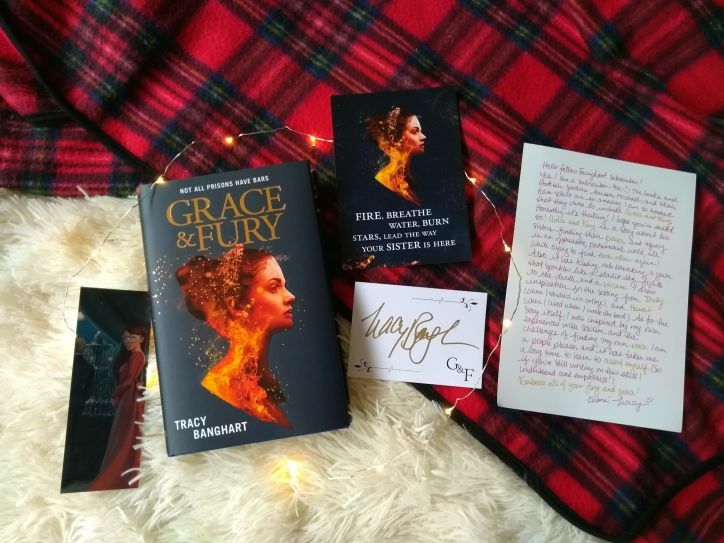 Finally the book for this month was Grace and Fury by Tracy Banghart. This book contains a feminist fantasy about fierce sisters, rebellion and a ball! 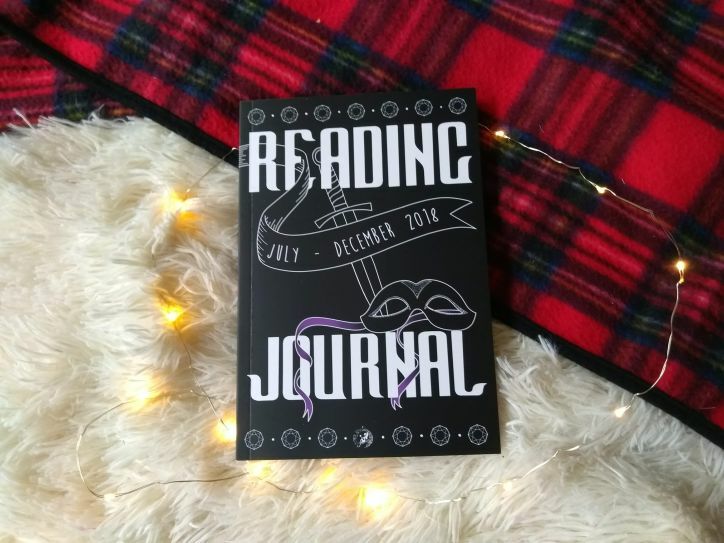 The book also has an exclusive hardback from FairyLoot! To go alongside the book there was a signed bookplate, a postcard and an author letter! This box was incredible and with so many items I’ll get use of! What was your favorite item? 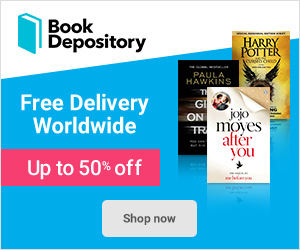 If you are interested in signing up for Fairyloot’s July box “The Power Within” follow the link here! Previous Previous post: Heir of Fire – Book Review!